Pakistan says it has asked the United States not to appoint the former head of the US prison at Guantanamo as military envoy in Islamabad. Foreign Minister Shah Mehmood Qureshi said his government had "genuine reservations" over the appointment of Maj-Gen Jay Hood. Washington has already cancelled the posting, The New York Times reports. No formal announcement has been made. Correspondents say the appointment would have provoked uproar in Pakistan. Hundreds of Muslim prisoners, many from Pakistan, have been held at Guantanamo without charge since the prison was set up following the 11 September, 2001 attacks on the US. Pakistan's foreign minister said his government wanted Washington to respect its concerns over Gen Hood's proposed assignment. "We are allies and partners and we understand, and we should understand, each other's needs," Mr Qureshi told the Senate, parliament's upper house, on Friday. "If... our request is not entertained then we have options not to allow Hood and people sharing his thinking inside Pakistani territory." On Thursday a spokesman for Pakistan's foreign office said the US would take a decision on the posting bearing in mind Pakistani "sentiments and sensitivities". 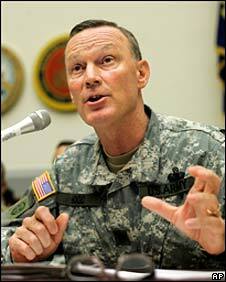 Maj-Gen Hood would have become the most senior US officer in Pakistan, a key ally in the US-led "war on terror". His appointment was announced in March. "It reflected the military's aim to put a crisis-tested veteran in a critical job at a pivotal time in the fight against al-Qaeda and the Taleban in Pakistan's tribal areas," the New York Times reported. The paper quoted a US Central Command spokesman as saying Gen Hood was now being considered for "a different, equally important job" at command headquarters. During Gen Hood's command at Guantanamo between 2004 and 2006 detainees on hunger strike were force-fed with tubes. Brig Gen Jay Hood admitted in 2005 that there had been a number of incidents involving Guantanamo guards showing "mishandling" the Koran. In recent weeks, a number of reports in the Pakistani media have been highly critical of Gen Hood's proposed posting.